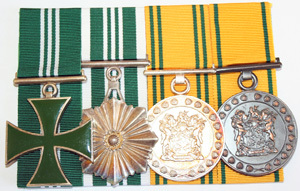 Group of 4 to WO 21455H JAA Smit consisting of SA Prison Service Medal for Faithful Service Bronze (10 year), Silver(20 year), SAPS Medal for Merit and SAPS Cross for Merit. All medals are named. Original certificates for the first three come with this set.